Oklahoma Connection | McCaleb attended Oklahoma City’s Putnam City High School. McCaleb and the ODOT traffic engineers discovered and installed the “Briffin barrier,” the first high tension median barrier in the nation, making Oklahoma the vanguard for this new technology which became a nationwide standard and has saved the lives of thousands. Neal McCaleb’s career as a civil engineer spans more than 50 years. Following graduation from Oklahoma City’s Putnam City High School and Oklahoma A & M (now Oklahoma State University), McCaleb became involved in the design and development of the Interstate Highway System. He joined the Oklahoma City Engineering Department, attaining the position of Assistant City Manager, before opening his own consulting engineering firm. It was during this time that McCaleb began building and developing residential subdivisions in the Oklahoma City metropolitan area. In 1974 McCaleb was elected to the Oklahoma House of Representatives, serving eight years, four as the Republican floor leader. Gov. 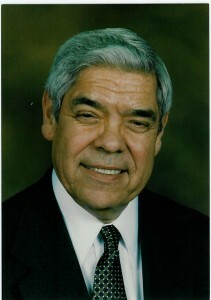 Henry Bellmon appointed him the first Secretary of Transportation in 1987 while also serving as the director of the Oklahoma Department of Transportation (ODOT). During this administration the Oklahoma Turnpike Authority (OTA) initiated the urban turnpikes in Oklahoma City and Tulsa, as well as the rural turnpikes in eastern and southern Oklahoma. During the administration of Gov. Frank Keating, McCaleb again served as Secretary of Transportation and director of the OTA and ODOT. He presided over the completion of the urban turnpikes and the implementation of the $800 million Highway Capital Improvement Program passed by the Legislature in 1999. Appointed by President George W. Bush in 2001 as Assistant Secretary of the Interior, McCaleb was in charge of the Bureau of Indian Affairs, advocating for the improvement of Tribal Nations through the implementation of tribal sovereignty. Before leaving government service in 2003, the Bureau of Indian Affairs was reorganized to ensure improved trust oversight of assets, both individual and tribal, held by the Department of Interior. McCaleb’s interest and advocacy of Indian economic development continued, becoming special adviser to Gov. Bill Anoatubby of the Chickasaw Nation. An enrolled member of the Chickasaw Nation, McCaleb has served as chairman of the board of Chickasaw Nation Industries and on the board of directors of Bank 2, a wholly-owned business of the Chickasaw Nation. In 2014, he served as Ambassador-at-Large for the the Chickasaw Nation. Considering it an honor to serve others, he is the former chairman of the Oklahoma Academy and president of TRUST (Transportation Revenues Used Strictly for Transportation). Others benefiting from his leadership include Oklahomans for Indian Opportunity, President’s Commission on Reservation Economies, and the University of Science and Arts of Oklahoma. See pictures of Neal A. McCaleb and other media HERE.